The cardiologists and surgeons of the Missouri Baptist Cardiac and Vascular Center perform more than 6,000 heart procedures a year in state-of-the-art facilities. Each of these 6,000 patients has something to learn about diagnosis, treatment, and ongoing lifestyle management. In general terms, approximately 10,000 people who enter the Center in any given calendar year have a need to high quality patient education in the cardiac and vascular field. 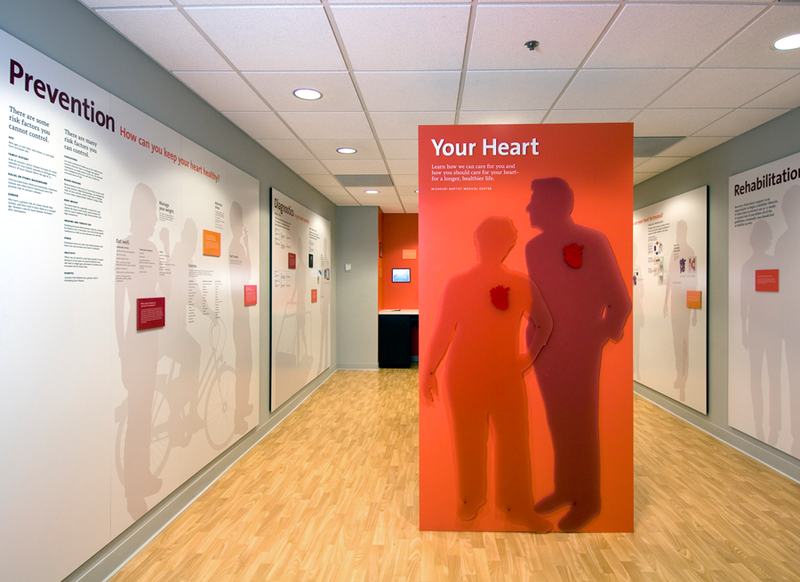 While working at Washington University’s Visual Communication Research Studio, we were commissioned by Dr. Nicholas Kouchoukos, one of the Center’s leading surgeons, to design an education room targeted to patients, their families, and Missouri Baptist staff. Our goal was to reinforce the leadership role being played by Missouri Baptist, resulting in greater patient knowledge and increase motivation to address disease management and accomplish lifestyle change. Part of our responsibility involved taking important data and research and distilling key findings into compelling visuals. The 250 square foot space was a challenge to design within. We utilized every wall surface and even built a freestanding structure to give us more. Content was divided into six categories: Prevention, Diagnostics, Conditions, Function, Intervention, and Rehabilitation. The viewer can move counter clockwise within the space, but each panel can stand on its own, as well. Life size silhouettes were created as a easy way to layer information and attach actual devices to. Hundreds of pages of content and research were examined, translated, edited and written to a 5th grade reading level. To help ease the vast amounts of reading the client wanted the viewer exposed to, we created two animations focused on the circulatory and electrical system. The content for these animations totaled more than 300 pages of text! Click below to view.